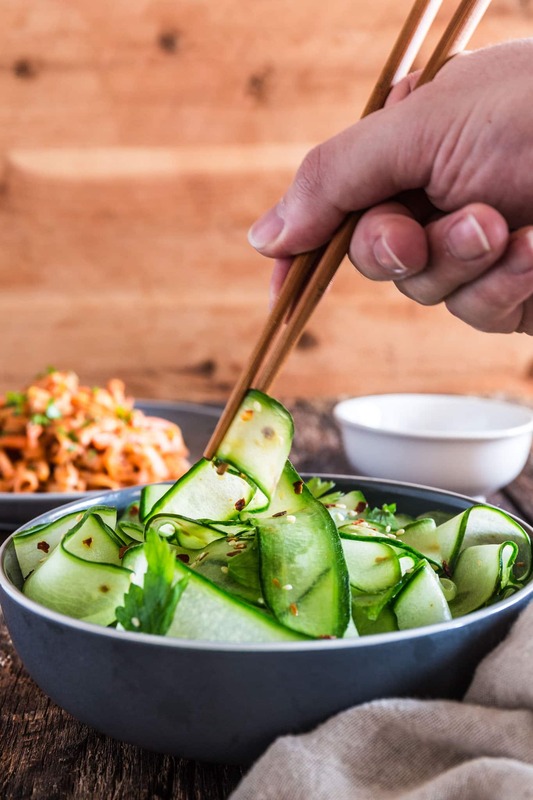 Some of the best pleasures in life are the simple ones, like this refreshing and light Thai Cucumber Salad. It comes together in less than 5 minutes, so you won’t have to miss any second of that sacred summer sunshine! Twice in one day? Yep! I’m working extra hard today. Well, kinda… I’m not sure you’ve noticed that my recipes have been on the simple side lately. I know my grandma has! We were talking on the phone the other day and I was complaining about being pregnant (after all that’s all I do these days! ), about being tired and not having the energy for anything too complicated. Her reply? “Yeah, I’ve noticed that you’ve been taking the easy route on the blog.” ??? And before you even ask: yes, she meant it as criticism! You see, I come for a very patriarchal country, where women are responsible for taking care of the house and cooking for their men. Even if they have their own jobs… or/and if they are super pregnant, like me. So my grandma is usually horrified whenever I mention that Tim is making dinner (usually grilled cheese) or doing the laundry. I am not even a little bit ashamed to confess that I haven’t done laundry since we moved in together 5 years ago. ? The truth is…Things have changed, grandma. Men can clean and cook too, ya know! And in case they can’t – or if their wives are not too fond of their cooking – there’s always delicious Saffron Road meals to save the day. Which is exactly what we had for dinner today, along with a fresh and simple cucumber salad. 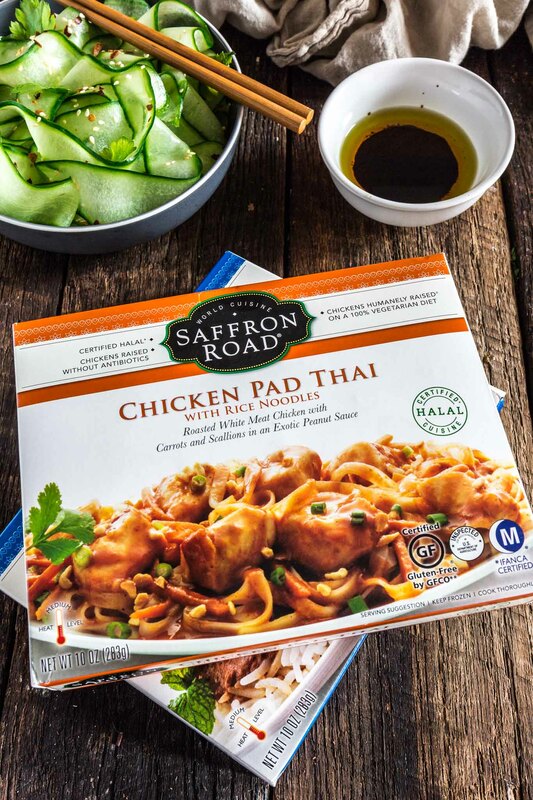 Saffron Road frozen meals are a direct route to the world’s greatest cuisines! Their meals are filled with premium ingredients, resulting in delicious flavors – perfect if you’re looking for restaurant quality taste in just 5 minutes! 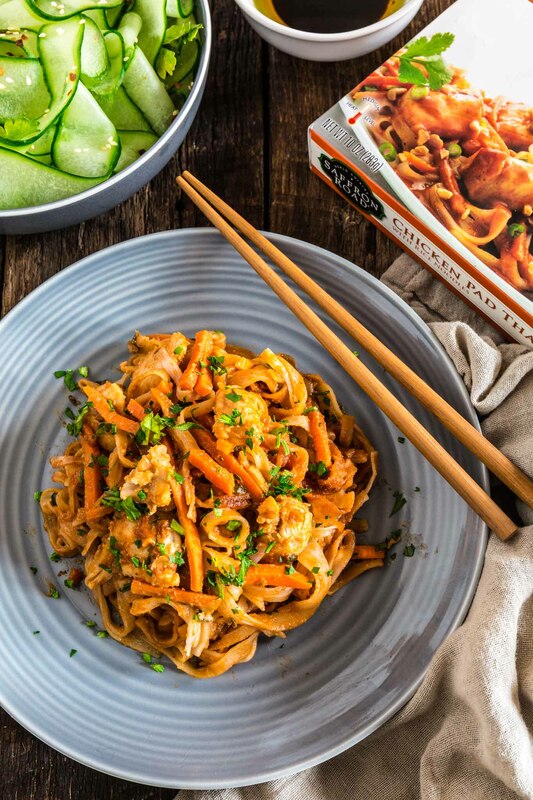 We went with the Chicken Pad Thai, which is served with rice noodles and smothered in a delicious and exotic peanut sauce. Oh you guys, it was pure perfection and a great meal to a perfect Saturday! It was also pretty satisfying on its own, but I’ve been eating for two so I couldn’t resist making a Thai cucumber salad to accompany it. 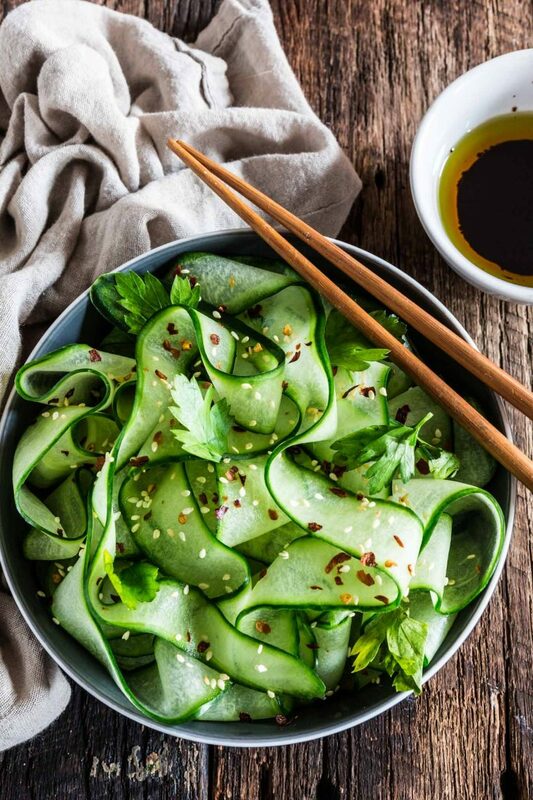 But, please, don’t underestimate this delicious Thai cucumber salad just because of its simplicity. Back to basics dishes often impress me because they remind my palate that fresh ingredients can shine on their own (or like here, with the aid of a few side kicks like the ginger dressing and a little spice from the red pepper flakes). 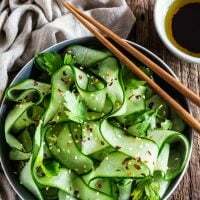 No need to dust off the spiralizer or the mandoline to make this. I used a good old veggie peeler and my cucumber was paper thin just how I like it! ? Give it a try! I’m sure it will become a recurring favorite during the summer. 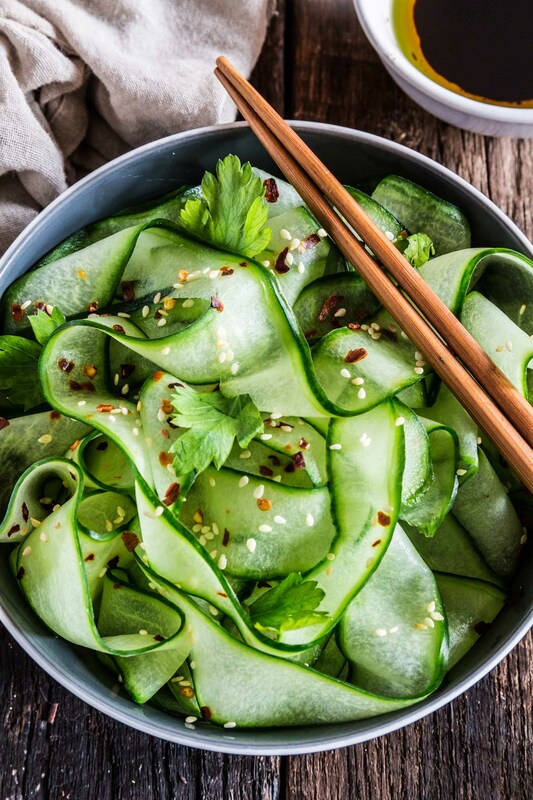 After all, cucumbers are one of summer’s best cooling ingredients! Good news! Saffron Road is giving away assorted Saffron Road frozen entrees and bowls to one lucky winner. I want to try the Chicken Tikka Masala. I would like to try the chicken enchiladas poblano. I am most interested in the enchiladas al chipotle. I would like to try the Chicken Pad Thai the most. I’m definitely going to make this salad to go along with it! The Lemongrass Basil Chicken sounds delicious!